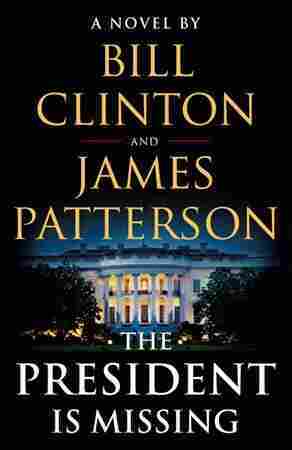 Bill Clinton And James Patterson's Thriller Stars A President Facing Impeachment The President Is Missing follows a commander in chief trying to thwart a cyberattack — and not lose his job. Clinton co-wrote the book with best-selling author James Patterson. I am alone at my chair. No aides, no lawyers, no notes. The American people are not going to see me exchanging hushed whispers with an attorney, my hand over the microphone, removing it to testify that I have no specific recollection of that, Congressman. I'm not hiding. I shouldn't have to be here, and I sure as hell don't want to be here, but here I am. Just me. The president of the United States, facing a mob of accusers. Those lines were co-written by best-selling author James Patterson and a man who has himself faced impeachment: former President Bill Clinton. Their novel is called The President Is Missing. It follows a fictional president as he tries to thwart cyberterrorists who aim to completely cripple the United States. Clinton and Patterson spoke to NPR about how realistic the book's plot is and the experience of impeachment. Clinton: Yes, I think it could be done. And I think someone could take out at least one of our grids, the eastern half of the country, and simultaneously fry the transformers so you couldn't bring it back up in a hurry. Someone could take out the bank records and, if you had a clever enough virus, simultaneously the backups. Patterson: We talked to dozens of experts in this area and they do believe that this is possible and it's something — you know, on some level this will happen. Clinton: The answer is, in theory, yes; in practice, it's hard, as you saw. Anybody besides the president who has Secret Service protection can actually sign off of it, and basically assume liability. And others have done it. We can find no example where a president ever did it. I never did. Every president wants to 'cause you just get tired of never being alone and in control of your destiny, but it's irresponsible to do. Patterson: And there are several lawyers who said, "Yes, it could happen." You would also find some lawyers that say you couldn't do it, but you would have lawyers that say, "Yes, you can do it." On a speech in which President Duncan declares, "Our democracy cannot survive its current downward drift into tribalism, extremism, and seething resentment. Today it's 'us versus them' in America." Patterson: I don't think the book is terribly political. In fact, it isn't, and we really went out of our way. And in that speech, I mean, you definitely feel President Clinton, and I think that's good. I'm happy that we did it that way. And if I wasn't, I would have said, you know, let's calm the speech down. Clinton: It's important that people understand that you have to develop the capacity, if you really want to serve people, to basically almost disengage yourself from whether something is making you angry because it's not fair to you. It's almost like you can't exist — it's almost like you can't have feelings except for the American people. You shouldn't be mad except on behalf of the American people. Everything else has to be calculation so you can maximize your capacity to do the job you put your hand on a Bible and swore to do. Kat Lonsdorf and Courtney Dorning produced and edited this interview for broadcast. Patrick Jarenwattananon and Nicole Cohen adapted it for the Web.